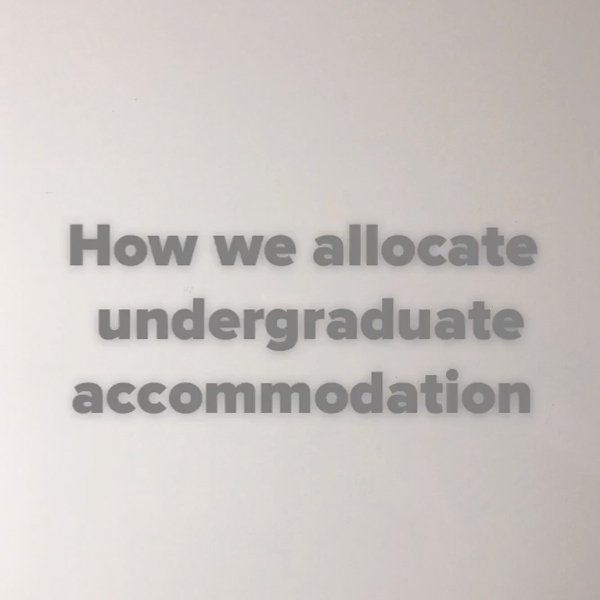 Here you can access the accommodation application form, see step-by-step details of applying for University-allocated accommodation and see what you need to do when you are offered a room. Before you apply make sure you have read the Residence Conditions and Local Rules available from your residence website so you understand the rights and responsibilities you are taking on when you come to live in our accommodation. Applications for University-allocated undergraduate accommodation for the 19/20 academic year will open on 1 May 2019. Once you have applied for accommodation and A-level results have been confirmed, we begin to allocate students to rooms. Accommodation is not allocated on a first-come-first served basis. For the second round of applications residences that are already oversubcribed will be removed from the preference options, so those applying later in the process will have a limited selection of residences. The University is committed to creating balanced communities in all its residences, reflecting the overall profile of the student body. The selection of residences is managed by the Accommodation Office. Selections are randomised within fixed criteria: student preference, gender, nationality, school type, faculty. Students with disabilities, health-needs or other special requirements will be considered on a case-by-case basis. Only one offer of accommodation will be made. No individual will be unjustifiably discriminated against. This includes, but not exclusively, on the basis of gender, race, nationality, ethnic or national origin, religious or political beliefs, disability, marital status, social background, family circumstance, sexual orientation, gender reassignment, spent criminal convictions, age or for any other reason. You will be sent an email on the accommodation offers days with a link for you to log in and access details of your accommodation offer. If you applied for accommodation in the first round of applications, which closed on the guarantee deadline of 30 June, your accommodation offer will be made on 21 August 2019, and you will need to accept by 28 August 2019. If you applied for accommodation in the second round of applications, which close on 31 August, and we are able make you an offer, your accommodation offer will be made on 4 September 2019 and you will need to accept by 7 September 2019. We will only make you one offer. You normally have 3-4 days in which to accept your offer. Due to the large numbers of applicants it can take a while to process offers. If you do not receive your email by 6 pm log back into your application following the link on our home page, your offer should be there. If it isn't give us a ring. Check your offer email carefully. If you miss the acceptance deadline you will lose your room and we may not be able to offer you another. Why is my offer not for my preferred residence(s)? Unfortunately every year some of our residences are over subscribed and we cannot offer places to all the students who would like to live there. We appreciate this can be disappointing at first. Look at the web pages for the residence you have been offered, join the Facebook group and get to know some of the other students who will be living there. And remember - none of our residences are a bad place to live! I have been offered a temporary shared room, what does that mean? We occasionally need to double up some rooms at the start of term. In 2017 a total of 150 students had to share a room at the very start of term. By the end of November, all students who wanted their own room had been moved. Some of these temporary sharers chose to stay sharing for the rest of the academic year. If your offer is for a temporary share, please do keep an open mind. These temporary shares are very short-term, can be a great way to meet new people at University and, because you pay a reduced fee while sharing, it's a cost-saving option too. Can I change, transfer or cancel my offer? It is not possible to change your offer or move you to another residence at this stage. You must not transfer your offer to another student yourself, as this could mean you are charged for two amounts of fees. We recommend you accept your accommodation offer so that you are guaranteed somewhere to live. Once you move in to your residence you can then join our transfer waiting list, which opens after the first two weeks of term. Details about moving between residences can be found on our current undergraduate students page. What if I've been offered more expensive accommodation than I asked for? Occasionally we have to offer a small number of students accommodation that costs more than their selected maximum fee. This is because we have too many applications for our lower-price rooms. You should accept your current offer so that you are guaranteed somewhere to live. As soon as less expensive accommodation becomes available we will make you an alternative offer. We will usually be in contact with an alternative offer before the start of term, or soon after. Remember, you don't need to pay accommodation fees until after you have moved in. If your question has not been answered here, please do contact us. You don't need to pay any accommodation fees at this stage, as long as you have accepted your offer of accommodation you will receive an invoice after you have fully registered at University. How do I accept my offer if I am out of the country? If you are out of the country you can still accept your offer as long as you have internet access. If there is a chance you will not have reliable internet access, make sure you arrange for a parent or guardian to accept the offer on your behalf. They will need your 7-digit student number and must be able to access your offer email. Once you've accepted your offer, naturally you'll start to think about moving in to your new home! Your offer will contain a lot of information about your new residence, including the terms and conditions of living in University-allocated accommodation and the rules and regulations for your residence. You should take the time to read this information, and investigate your residence guide before you arrive so that you know what is expected of you as a tenant of the University. Now is also the time to think about insurance for the belonings you'll be bringing with you to University. The type of cover you have varies according to which residence you are in, and you can get details on our accommodation fees page. It is your responsibility to check that the level of cover offered is adequate to cover your belongings. If you plan to bring your bicycle with you you should top up your cover as bikes are not covered by any of the policies. Information for students applying in the second round of accommodation applications as non-guaranteed applicants.